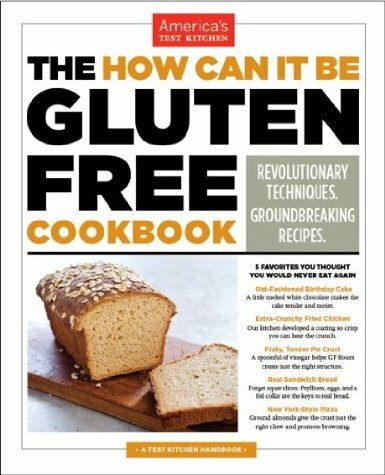 I was very excited to find out that Americas Test Kitchen (ATK) was publishing a gluten-free book. I’m a big fan of their shows on PBS. Even though I can’t use most of their recipes as is, they give me enough information that I can usually convert the recipe to suit me. ATK acknowledges that they can’t cover all allergy needs with this book and they really didn’t even try. Most of the recipes have dairy in them which is a top allergen. They gave a cursory recommendation to substitute soy in their flour blend recipe. Hello! Soy is another top allergen. It was painfully obvious to me that Americas Test Kitchen does not understand their gluten-free/allergy audience. Just like their PBS show, they made assumptions on what would be too hard for the average home cook to do and dumbed down some of the recipes. I’m not too surprised. But, how can you even compare the “average” home cook with someone who cooks for food allergies? ATK’s flour blend includes dry milk powder which a lot of allergy sufferers can’t use. ATK chose not to use calcium carbonate even though it worked perfectly because “the hassle factor outweighed the benefits.” What hassle? This doesn’t even make my top 20 list of food hassles since my allergy diagnosis! I looked calcium carbonate up. In less than ten seconds, I found that it’s an inert mineral powder supplement that’s pretty cheap and healthy if you need to supplement your calcium intake. Bonus! I bought some and I’ll store right next to my guar gum and nut pulp—two things the average home cook also doesn’t have in her kitchen! Now I just have to figure out if I can sub it out with the milk powder 1:1 or if it requires a different amount. I’ll report my findings on this blog when I figure it out. They provide the science roadmap to creating my own gluten-free blend. This was my main hope when I first heard of the book. I have a high degree of confidence that I can modify their recipes based on the background info they provide surrounding the testing that they do on each recipe. A lot of the basic bread-type recipes have dairy in them even beyond their flour blend. I wish they had taken the time to offer viable non-dairy alternatives considering they made it so prevalent in their recipes. There’s a lot of filler recipes in here. By filler, I mean recipes that never had gluten in them in the first place, like polenta and socca. 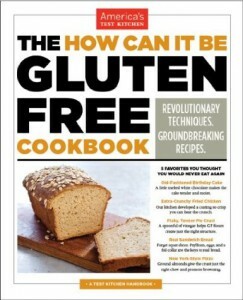 They seemed to use this book to cover all grain-based recipes. If you’re lacking an all grain cookbook, they’ve got you covered! I’m happy that I bought the book. The science portion while small (ends on page 31) was full of just the sort of detail I was looking for. A+ for the science, a C for the recipes. The biscuits were very tender, flavorful, and moist. The tops cracked, the bottoms didn’t brown, and they spread a bit in the oven. I’m calling it a decent first attempt. For the next test, I think I would make smaller biscuits, add more psyllium husk powder, and bake them 1-2 minutes longer. The upshot is that the calcium carbonate can be substituted 1:1 with the dry milk powder with reasonable results. 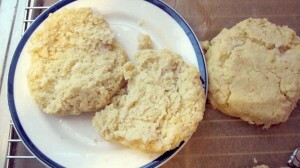 Once I have a final biscuit recipe that I’m happy with, I’ll share with you! I have modified another recipe from this book and created an un-cornmeal muffin and a savory stuffed muffin. Check them out! This post was shared on Allergy Free Wednesday. This entry was posted in Baking, Review and tagged baking, gluten free. Bookmark the permalink. I wish you hope, health and happiness. 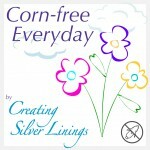 Check out the latest Corn-free Everyday Link Party! Folate: If You Can’t Make It, You Gotta Take It! Small Batch Mayonnaise - 5 Ingredients! Persian Shepard's Pie - Tahdig as a One Pot Meal! Note: I am not affiliated with Amazon or any other company at this time. I do not get paid to link to products. ©2013-2014 Jillian Hudson All rights reserved.